Sherman in the trenches near Atlanta. Following his successful raid of Chambersburg, Pennsylvania two days prior, Confederate General John McCausland and his forces head toward western Maryland in an attempt to inflict further structural and political damage upon the United States. Union forces, however, effectively engage the Rebels this day in the Battle of Folck’s Mill near Cumberland. Following a five-hour artillery duel, the Confederates withdraw and turn southward toward the Potomac River and West Virginia. Meanwhile this day, Ensign Hosea Garrett of Co. G, 10th Texas Infantry, engaged in the defense of Atlanta, writes to his Uncle Hosea Garrett Sr. in Chapel [Chappell] Hill, Texas. Garrett, Sr. is one of the richest plantation owners in Washington County, Texas, as well as a Baptist preacher, Baylor supporter and president of the Baptist General Convention of Texas. We have been lying in the ditches near the City for something like a week. The enemy has almost quit shelling this portion of our lines. It is said they are concentrating their forces on our center; for what purpose I cannot say. I hardly think that they will charge our works. I have heard repeatedly that they Yankee Gents can’t get their men to charge rebel works, and I believe it from what I have seen. I have heard them blow their forward calls but could not get their men in advance. We have had three fights with them, beginning on the 18th of July and lasting to the 22nd of the same. It seems that our Brigade is quite lucky to get into fights. We Worsted them every time, but the last one, and I supposed did then. I understand that our Genl claims a victory even then …. There is a heavy cannonading on our left today, in fact has been ever since we have been here, with but short intervals between. We on this end of the line know but little or nothing about what is goin on on the other. It is thought that the enemy has an overwhelming force in our front, and I don’t doubt it, for we may stretch our lines as far as we can, and they have plenty of men to go around us. Our brigade is strong out in our rank, and so is one more on our right at this time, and there may be others for all I know, and yet it seems that they still outreach us. Report says that Genl Forrest & Lee from Miss. are coming to our relief, and the militia is being sent forward as fast as the trains can bring them, and we also have a rumor that Lt. Genl. Smith is coming over with his force from the Trans-Miss. Department. If we can get all the help that we hear is coming, we will give this army such a beating as no other has had. 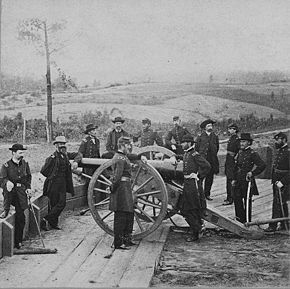 We have retreated from Middle Tenn. to Atlanta, fighting the enemy hard in several instances, and always whipping them when we had anything like an equal chance. I suppose that you have heard, or will before this reaches you, that Gen. Hood is in command of this Army. For what reason Johnston was released it is more than any of us know. The army had the utmost confidence in Genl. Johnston, and I well say that I have not heard a man say anything about it but what regretted his being released. All that I hear say anything about Genl. Hood say that he is too fond of charging the enemy’s works. We had rather not charge them, but would rather be charged by them, until our number equals theirs. And then we would be wiling to meet them in an open field. We are all quite tired of this war but will stay as long as life last of see the end of this cruel War …. I can’t believe that God will let such a people go unpunished. I believe that the day for their overthrow is not far distant. I have heard that they cut the throat of a very wounded man that they came across in Miss. They drove Forrest back the first day 5 mises, and this is the treatment that our brave soldiers, wounded at that, received at their hands. And I heard that some of our men found some of their wives tied to stakes and dead from the cruel treatment that they received from their foul hands. If such as this will not make men desperate, what will? We are not what we should be in a religious point of view, but I am certain that we have no soldier that would commit such outrageous acts on helpless women and children as theirs has been guilty of. I would to God that our entire Amy were true Christians. I have been spared this far, for which I thank God, for, both by day and night, I desire and entrust in the prayers of all relatives and friends in Texas. Pray the Lord to spare me though this cruel war, and that I may do some good in the name of my master’s cause. I have tried to make a Christian soldier as well as a soldier for my country’s rights. In this I pray to be sustained. [Ed: At Pickett’s Mill,] J. L. Clark fell, pierced through the head on the 27th of May. John Gary fell on the same day, shot through the body, but was carried to the Field Hospital and died in a day or two. He said to me that he wished me to tell his uncle John Walker know that he died an honorable death. He was shot near me while the battle was raging the hottest. He is gone, I trust, to heaven. He was a member of the Baptist Church. He made one of the best of soldiers. Let his uncle know this …. There are thousands of families that were in fine circumstances that have been broken up by the enemy, and I do not see anything but starvation for such opportunties. God can and may provide for all such. Oh, that I had the means and power to relieve them. My heart seems to reach after all such, and, if I had it, none should want for the necessities of life. Vengeance is mine, saith the Lord. I have been thinking for some time that I would like for you to preach my funeral at Old Providence Church, if I should fall in our struggle for liberty. I often think of the very spot in the Church where God forgave me for Christ’s sake for all I had ever done in sinning against his righteous laws. I thought then that my troubles were all over. But I find since that even the Christian has many trials in this life. But, blessed be God, there is a promise to those that hold our faithful to that end. And I am determined to be on of that number, by the help of the Lord. I have selected the 2 chapter of Paul to the Ephesians and 8 verse. It reads “For by grace are us saved through through faith and that not of yourselves” it is the gift of God.” This looks to me like it is a very appropriate text. However, I will leave you to judge …. Garrett’s letter is representative of the manner in which many families learn of the loss of a loved one during the war years. Away from battlefield action and in the heart of the Confederacy this day, South Carolina Baptist leaders pass a war-related resolution on the last day of their state Baptist gathering. Resolved, That the circulation of the Confederate Baptist among the soldiers and families of this State, is an important means of usefulness, and that Pastors are affectionately urged to take an interest in increasing the number of its subscribers. Renewed religion, it is hoped, will invoke the grace of God and help turn around the fortunes of the Confederacy.